Before cities had the wherewithal to dig subway tunnels, they built trains on elevated tracks. Today these elevated trains are remembered largely as a blight that darkened city streets. 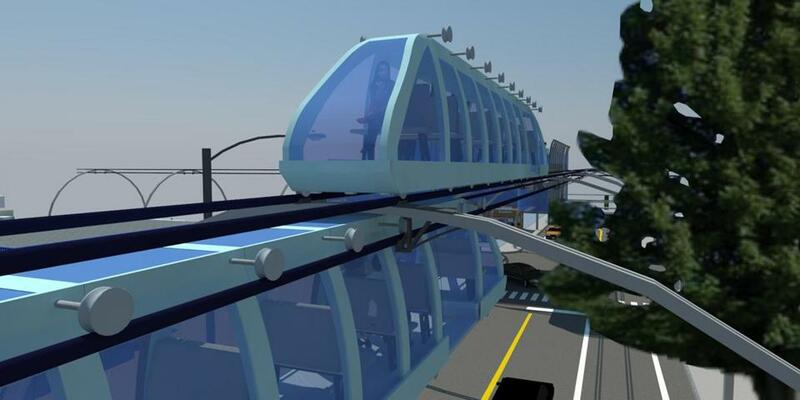 According to one Cambridge designer, though, they may also be the future of urban public transit. Emil Jacob is the creator of a proposal he calls “cTrain,” where the “c” stands for caterpillar. It calls for a network of thin cable-like pipes suspended above street-level that would carry small, automated electric cars over all MBTA routes. CTrain is a retro idea, in the sense of a return to elevated trains. It’s also forward-looking, with design features that approximate the flying cars of our sci-fi future. Jacob, founder of the transportation design firm Jacob Innovations, developed the concept of cTrain as part of his work as a graduate student at Boston Architectural College. His design calls for individual cars, 10 meters long, with a single row of 10 seats. “It’s one person per row, but each row can fit a second person if you’re traveling as a couple. Otherwise it’s private space,” Jacob says. Passengers line up to wait for the cars and walk to the points where a green light indicates an upcoming open seat, similar to the way customers find the next open teller at a bank. Upon boarding, they use a computerized system to indicate where they intend to get off — which helps cTrain forecast passenger flow and send out more cars as volume picks up. cTrains travel both above and below the tracks. A main advance over elevated trains of yore and present-day monorails is the way they are supported. Designed for seating room only, cTrain is about as tall as an average SUV and about 3-4 feet wide. Jacob anticipates the design is light enough to be held aloft by slender arches, planted in the sidewalk on either side of the street, that minimize the impression cTrain makes on the cityscape. For now, cTrain remains purely at the concept stage, and it’s one of many ideas floating around about the future of urban transportation. Jacob has not approached city officials in Boston, and he imagines cTrain will be an easier sell in developing places like Mumbai, where there’s a more urgent need for better transportation. Still, despite how far cTrain is from being realized, Jacob has put some dollar figures to the idea: He estimates the cost to replace the entire MBTA system (subways, buses, commuter rail) would be about $2 billion. Dante Ramos: Trains pit Mass. vs. Conn.